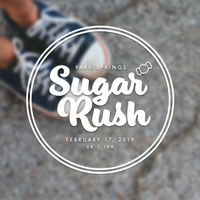 The 3rd Annual Sugar Rush will be held at Park Springs Bible Church on Feb. 16, 2019. This race is a wonderful scenic run in Arlington and will prove to be tons of fun for the entire family. All of the proceeds from the race go directly to the mission work of the church. The course will proceed through the surrounding neighborhood and will start and end at the church. There will be plenty of onsite parking and water stops along the race course. The course is a bit longer than a 5k and 10k so we are calling it a 5K+ and 10K+. We will only cancel if thunder and lightening are present. Packet pick up will be Thursday and Friday Feb. 14 & 15 10am - 7pm at "The Runner Shop" 3535 Pioneer Parkway, Arlington TX 76017 and on race day 8-5 at 5515 Park Springs Blvd. Racers can park on the church property as well as Mary Moore Elementary across the street. Please invite friends and family. Strollers will only be allowed on the 5K route.